Would you like something completely different for your wedding that will wow your family and friends as they witness your special day unfold. We have the perfect product for you as for all too long the cake table at weddings has been very bland with possible just a fairylight skirt or shaped fabric on the front of it. 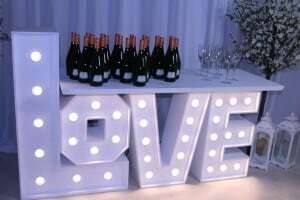 We have just launched our new LED Giant Letter Cake table. This table has been designed by us and manufactured exclusively for us by the people who produce our fabulous giant letters. 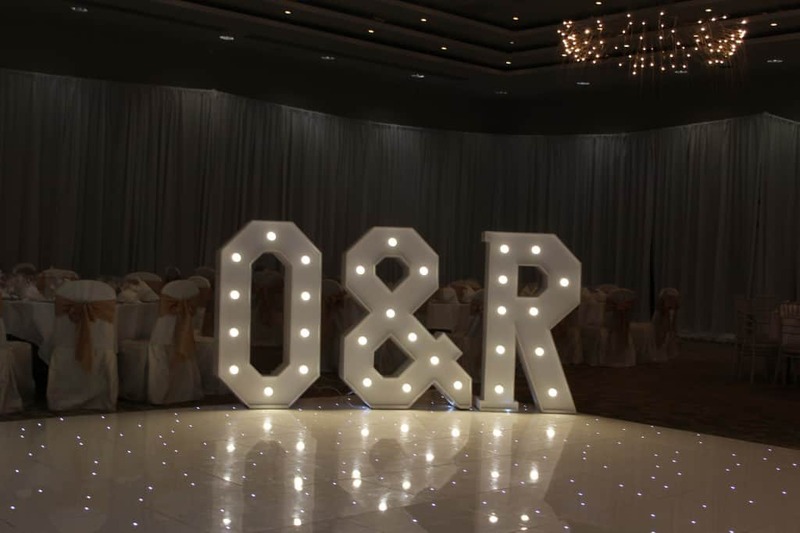 So it is a perfect fit with our giant letters which stand at an impressive 4 ft 6 inches tall and 10 inches deep making them one of the largest ranges of giant letters in the country. 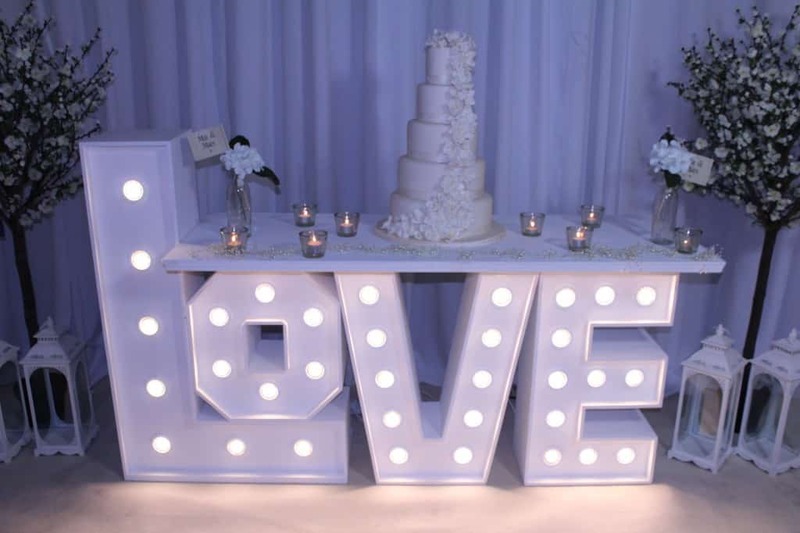 Our LED Letter table lights up and will look stunning with your initials or Mr & Mrs in our giant letters. 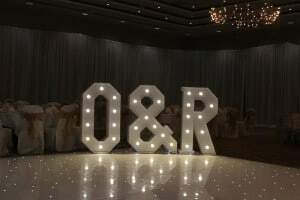 We have all combinations of letters available and have provided the following to weddings all over Ireland, the couple initials, MR & MRS, I DO, # I DO, HITCHED, JUST MARRIED, LOVE and many other combinations requested by couples. 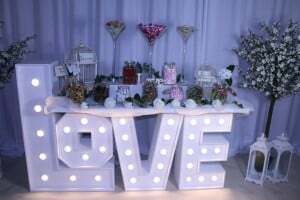 We designed our giant letter table as a cake table but already it has gone into weddings as a Prosecco table and also as a candy table and it is perfect for either and makes a fantastic change from the traditional candy cart that every supplier has. To compliment our light up Love Letter Table & Giant Letters we also provide custom built fairylight backdrops and now our brand new range of sparkling led dance floors. Our new twinkling dance floors have been purchased in 2017, this make them some of the newest sparkling LED dance floors in the country. Most importantly they are UK manufactured by the world’s leading dance floor producer which is a fantastic company called Grumpy Joe’s, not only are they stunning looking but as they are brand new they are also exceptionally reliable. To continue with beautiful quality lighting through your room hire us to build a stunning custom built fairy light backdrops behind your top table. 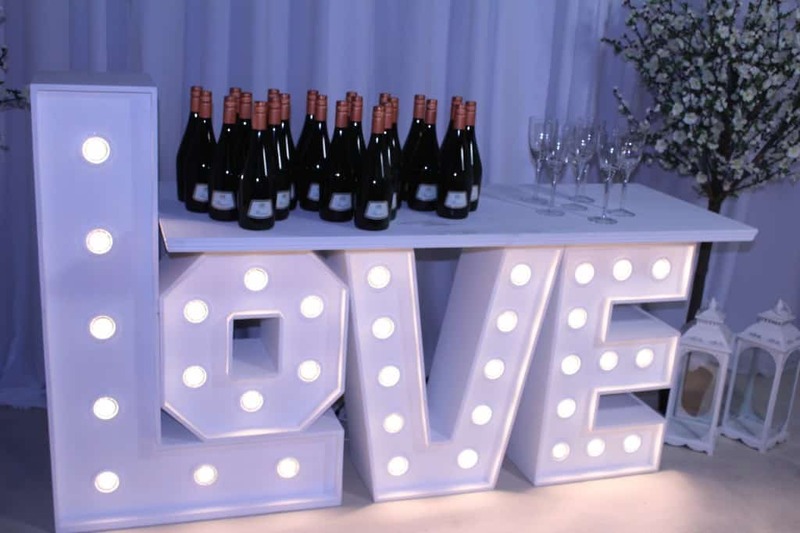 We can also add further intimate lighting by providing panels of fairylights around your walls to help make your room even more spectacular and totally different to most wedding. Contact us today and we can help you add a little WOW to your wedding.